Having a side hustle is great especially in these times. Having a few extra incoming rolling in can help with bills no matter how small it can go a far way. Not everyone is down with taking surveys. Surveys are tedious, time-consuming, long and not to mention boring. I tried over and over to be consistent but never could keep up with them. Hence, I made no money just points. So, What does a Website Tester do? A Website Tester analyses a website or app and gives their feedback using video recording. This will help provide opportunities and improvements seeing that it is done by random users are able to get real feedback. Do not think that this is a full-time job or get rich scheme. Companies tend to have more testers than users. Hence, you may receive 1 to no websites a day. However, if your very active and is great at what you do, you might be requested to do more jobs. Do you want to make easy side money working as a website tester? 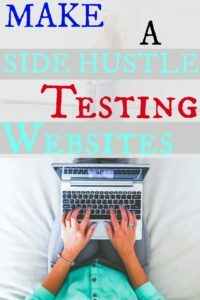 I researched a few top website testing company that you can make great side hustle cash. But wait, so that you know there are a few requirements all site requests. However, there are a few who has their own requirements. I will link the sites down below. Testing Time Get paid conducting testing studies, interviews, focus group workshops and online surveys get paid via PayPal. This may not a career or something you may want to consider full-time, but it is definitely some time to have on the sideline a little extra income won’t hurt. Trust me it can go a far way. Drop in the comment some of your side hustling jobs. I love to know about them.